24 Jun 2008 (Tuesday) was the day I stepped out of retirement from the competition circuit. However, before anybody thinks that this is some big-shot tournament, it is not. This is just a business/social circle tournament organised amongst ourselves. Granted we have scratch golfers amongst our rank but a scorecard in the 70s should be good enough to clinch the Gross Score Champion and a low 80s scorecard will get you the Nett Score Champion trophy easily. Due to hectic work schedule, I missed 6 of 12 legs of the competition last season and so I thought if I am going to be so busy with work, why bother signing up and wasted the RMB 3500 entry fee? Also, I get hassled by the organisers each time I miss a leg. Yeah, these are very enthusiastic folks. Anyway, there I was arriving on the dot to check-in at the register. Bad omen #1. My name is not on the register. It's seems like they have struck me off and forgotten about me already. When I got to the starter's office. Bad omen #2. My main caddy was on leave and so I arranged for my back up caddy to carry my bags for that day only to find out that she didn't turn up for work that fateful day. Of all the days to go AWOL, why today??!!! God dammit!! You're fired! I started off pretty strongly with a display of new flawless golf in the front 9 that put me easily in the Top10. Granted that we didn't have scoreboards to show real-time standings but experience told me that I am somewhere near the top. Come the turnaround and everything starts to fall apart. Granted that I was able to recover from a few mistakes like a 190-yard green-in-regulation recovery shot after a dismal tee off, followed by a simple 2-putt to save par. That and an almost identical save from 180 yards for a fortunate bogey. Look at the picture above and you won't believe me if I told you that it was taken on the day Typhoon FengShen came. I was on the 15th hole when the sky suddenly turned dark and boy was it quick. The winds started howling from out of the blue and a look up into the sky and we could see a mass of dark clouds rushing in our direction like a speeding truck. It was a mad rush to whip out the rain cover to pull over our clubs and a mad speeding down the cart part towards the halfway house. The rain came in so fast, we were drenched before we even goto the shelter. The rain drops came falling down fast and furious and it would have hurt like hell if you were to just stand there in the rain. That's how bad the rain was. Then it was announced that the tournament was abandoned due to the bad weather while we waited for the rain to pass. 15 minutes later, the rain stopped and the organisers did a check on the grounds before making a u-turn decision to resume play. Apparently, that wasn't the typhoon but a mere preview of what's to come. I finished the rest of the holes with 2 pars and 2 bogeys to finished with a so so 87. That puts me in 16th place out of a unusually small turnout of 56 participants. Oh well, it doesn't really matter. I never took it seriously anyway, just an excuse for me to get out of the office to get some sun. p.s. By the way, this season's trophy is unusually FUGLY. I think I'll give it a miss. your backup caddy is a she? sui bo? 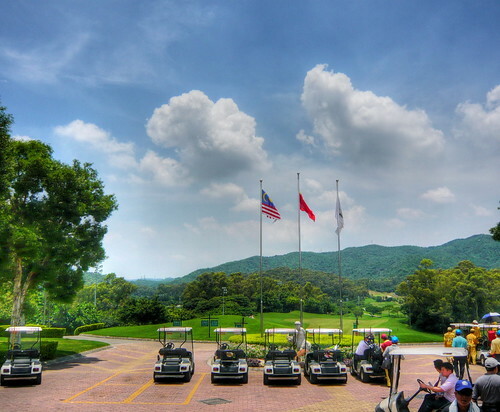 spinner: The club was developed by the same people who are running the Pulai Springs Golf & Country Club. Can see Agung's name on the board of honorary members. Primary caddy is guy. Backup caddy is girl. Not swee. Pui pui one.